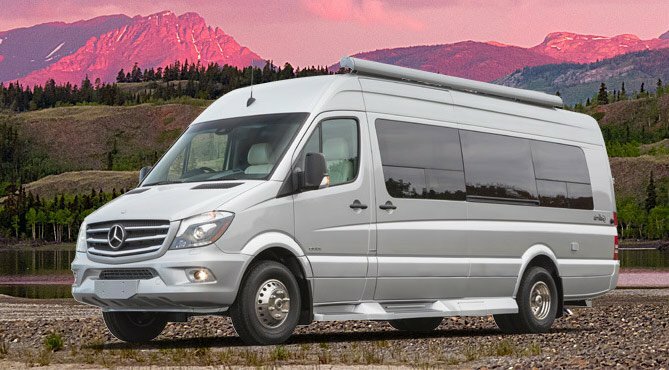 Why rent a Mercedes Campervan? Each Sprinter is self-sufficient, with a self contained waste system, so you can continue to explore for several days before you need to evacuate your waste tanks. You carry 30 gl of fresh water. You can generate your OWN electricity to power your major appliances. Your lights and outlets run off batteries that charge while you are driving. Your water heater will make your showers heavenly every day if you plan to travel and stay outside the campgrounds. Our solar Mercedes Sprinters are ‘the’ state of the art Van Campers. With an electric-only hookups on the SOLAR units, you drive a short distance to a campground once or twice a week to fill your fresh water tank and dump your waste, but otherwise, you are self-contained and can stay “off the grid”. Freedom from “hookups” also opens up a whole range of national and local forests, and desert campgrounds with limited or no hookups. You can ‘dry camp’ (aka boondocking): there are NO RULES for where you can or can’t boondock, so you are a truly independent traveler. This vehicle maneuvers like a mini-van. There are a gazillion Mercedes Sprinter safety features built into this Campervan. Our Mercedes Sprinters have full bathrooms with a shower, sink, and toilet. Full kitchen with two burner propane stove, refrigerator/freezer, plenty of storage for food, a functionally sized sink, chef knives and tools, quality cookware and serviceware. Cabinets for clothes, games and anything else you may want to bring. There are two completely removable dining/card/conversation tables. Don’t forget to bake a casserole in your oven! Or fresh morning scones. You have numerous electrical outlets for your laptop or smart phone; there are overhead and under counter lights everywhere for every purpose… even a toaster and a French press! Stocked with premium coffee… and treats! Full heating by thermostat; cooling via A/C and two fans to keep your inside travels comfortable to your taste and needs. Every Mercedes Campervan rental has a VIZIO 24” LCD TV with full surround sound, a DVD that you can watch from bed, while you look out your privacy windows to check the scenery. Sirius Satellite Radio is available in most of the rental units: bringing you all that great road music of the 40’s 50’s and 60’s all the way to hip-hop. Winnebago Revel 44E has a rear queen power lift bed, full kitchen and bath, and gets 18-22+ MPG. Pleasure-Way Ascent has a rear queen bed configuration, full kitchen and bath, and gets 22+ MPG. The SS Agile 2500 has a rear queen or twin bed configuration, full kitchen and bath, and gets 25+ MPG. You can customize your roadtrip with many equipment and/or service options once your rental application is approved. Ride the roads of America. Stop wherever and whenever you’d like. Regain your spontaneity; your sense of adventure…..
WAKEN those senses. FEEL the joy!! Adventure like Kerouac. Write your own story. "We had such an amazing time on our Roadtrek trip through Colorado last year that we are anxious to do it again...only this time in Montana." "Tom and I really enjoyed our inaugural trip with 'Bernie' (yes, we felt like we had to name him) and we truly enjoyed getting to know how to “glamp' with the van. Tom and I are looking at possible van rentals for the early fall for Yellowstone, Grand Teton and Glacier. When is the ideal time in your opinion, to do this trip? Also, thank you for mailing my fav forgotten jacket back to me."